Rep. Paul Ryan, according to NBC News and Jon Ward. Good enough for me! I’ll have more tomorrow if/when actually hear from the man upon whose conservatives have placed the crown of leadership. Does Ryan have to give up his House seat? No. See Wisconsin’s election statute 8.03, which specificies that the prohibitions on running for multiple offices “shall not apply when a candidate for the office of president or vice president of the United States is nominated for another elective office during the same election. If the candidate is elected president or vice president of the United States such election shall void the candidate’s election to any other office. A special election shall be held to fill any office vacated under this subsection.” As was the case when Joe Biden joined the Obama ticket, the veep nominee can run for his current job, just in case. What will conservatives think? Are you kidding? This has all the base-unifying power of the Palin nomination with none of the uncertainty. As John Dickerson explained back in June, as Scott Walker was fending off the Wisconsin recall, conservatives wanted Romney to embrace the Spirit of the Badger. “If [Romney] ran loud and proud in Wisconsin,” wrote Dickerson, “it would send a message that he’s going to govern in the same audaciously conservative mold as the state’s favorite young guns.” And now he has. Do Ryan and Romney have any static to get over? Sort of. Ryan’s task in life from at least 2007 on was to make his party out-evolve the Democrats on health care reform, to come up with a plan and popularize it. Well, that’s not really what Mitt Romney did in office, and that’s not what he’s running on. There’s a second- or third-day story here. What do Democrats think? They’re broadcasting all kinds of happy confidence. “Paul Ryan is the most anti-middle class nominee [Romney] could pick,” says Bill Burton, who runs the pro-Obama Priorities USA super PAC. 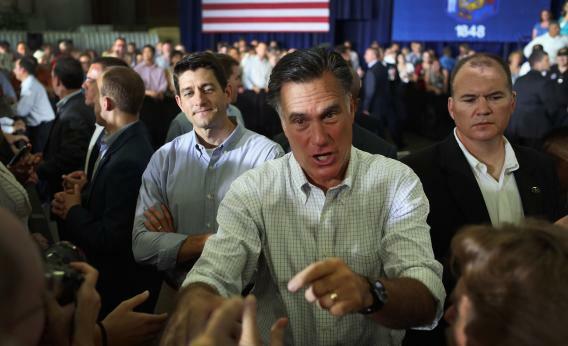 The Ryan choice “amplifies” that PAC’s message: That Romney is absolutely souless. Eddie Vale, spokesman for the big labor PAC Worker’s Voice, sends reporters a late-night memo alleging that “the destruction Romney and Bain wreaked would be thrust upon all of America by the Romney/Ryan plan.” Democrats have run against the Medicare portion of the Ryan budget in every significant election since 2011, and they’ve won a few – Kathy Hochul’s House race in New York, Ron Barber’s in Arizona. Of course, the Kristol/WSJ argument was that Democrats would do this no matter whom Romney chose, so why not pick the starting pitcher?